What with the BBC’s Gunpowder Plot and now Anders Lustgarten’s spymaster drama, we really seem unable to quite slough off our fascination with those grisly times when terrorism came in Catholic terms and we were once again at daggers drawn with our European neighbours. 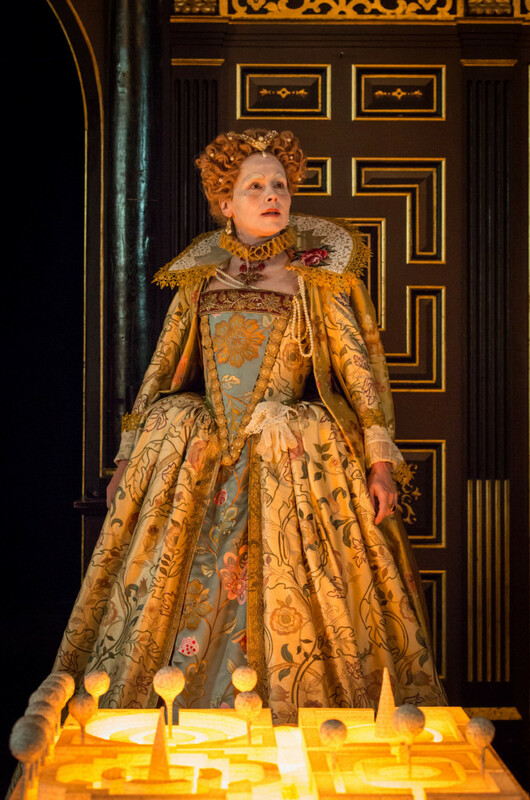 Lustgarten really couldn’t have hoped for a better, more appropriate venue than the Sam Wanamaker Playhouse. 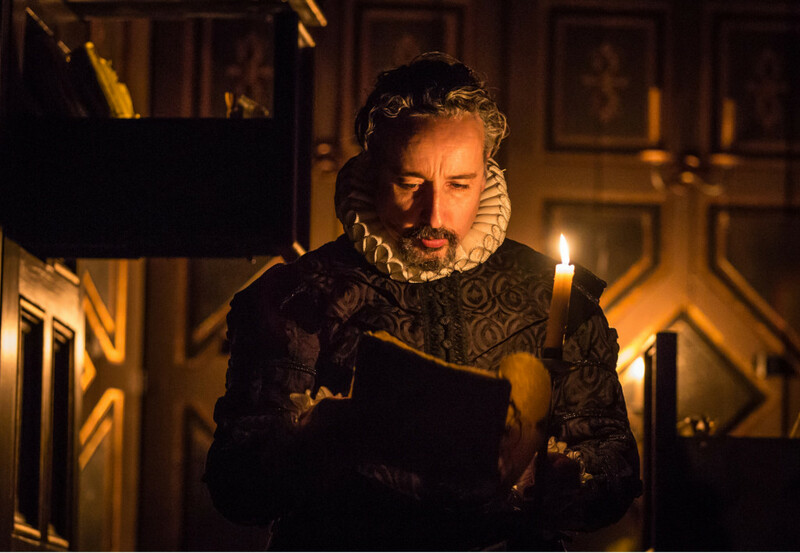 Sitting snugly as it does inside Shakespeare’s Globe, with its dark panelling and candle-lit ambience, Lustgarten’s intrigue laden latest, about Elizabeth’s master spy-catcher, Sir Francis Walsingham, works up a terrific sense of historical authenticity in an area notorious in its time for torture and killings – extra-judicial as well as official. There we sit, in our comparative safety, gazing into the crepuscular darkness of long ago as Lustgarten and director Matthew Dunster once again summon up the pitched battle that was Catholic and Protestant vying for the nation’s soul and with Walsingham machinations writ large. © Marc Brenner, Tara Fitzgerald, magnificently gowned as Elizabeth 1 – a hard nut and mean with it when it comes to handing out money for her national security. Lustgarten may have taken a few liberties with historical detail but he makes sure its parallels with today’s febrile atmosphere of `national threat’ is potently felt. Indeed Lustgarten sometimes makes the comparisons a little too obvious. But of course, he has a point to make – and within the context of an Elizabethan Playhouse, it’s a thoroughly entertaining and pertinent one – namely how security chiefs and the governing powerful will always work to keep a restless populace in place by encouraging a sense of imminent danger, even to fabricating the truth, and dabbling in the `dark arts’ to increase the sense of panic. Then, as now, Walsingham and his `mentor’, Lord Burghley, William Cecil, were not above creating or at least helping plots against the State, on their way. 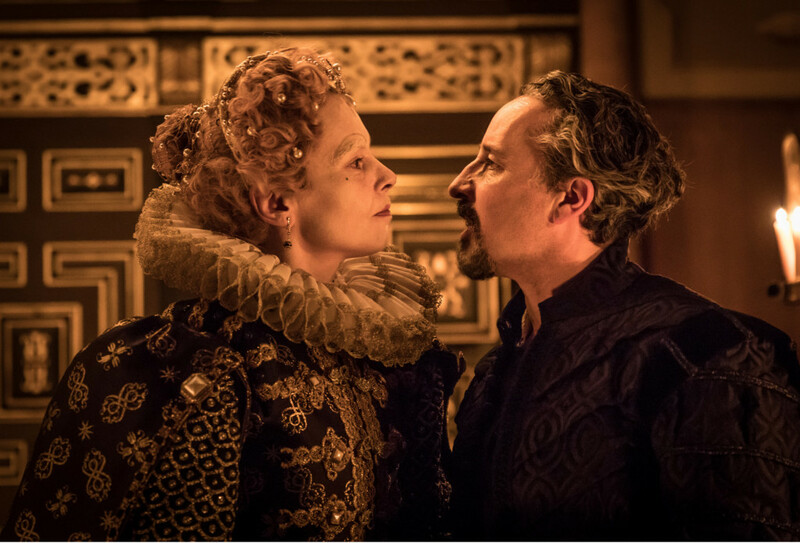 The Secret Theatre – the phrase is actually taken from our own spy chronicler-in-chief, Master John Le Carré – shows Walsingham actively involved in fostering the Babington Plot supposedly `uncovering’ Mary Queen of Scots plan to assassinate Elizabeth and giving Elizabeth her ultimate excuse, albeit reluctantly, to execute her sister Queen. We’ll never know but some of Lustgarten’s juiciest exchanges take place between Aidan McArdle’s furrowed Walsingham, always requiring more resources for his expanding security network of spies and Tara Fitzgerald’s magnificently truculent, blunt speaking `Virgin Queen’. Fitzgerald’s rich, mottled tones out-Dench Dame Judi’s beady-eyed monarch for which she earned an Oscar in Shakespeare in Love. Fitzgerald, on celluloid, would deserve no less. So its thrust and counter-thrust, conspirator and double-agent like Robert Pooley all inter-mingling alongside Walsingham’s pained relationship with his daughter – a doughty Cassie Layton – presided over at a distance by Ian Redford’s superbly devious Lord Cecil to whom Lustgarten allows the final word: an endless war of attrition against unknown foes. 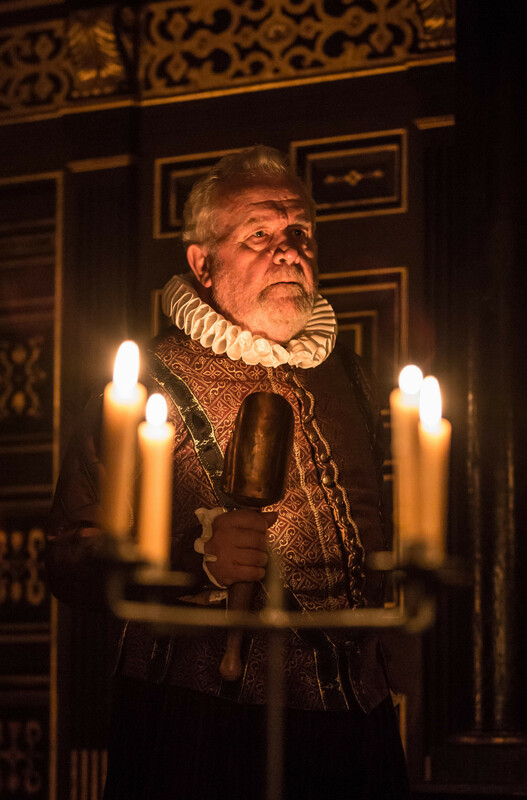 Dunster’s production doesn’t baulk from some of the nastier aspects of that Elizabethan `golden age’ – torture and the rack – but on the whole, he builds the sense of conspiratorial edginess purely by the lighting and extinguishing of candles as lives come into focus or enter moments of jeopardy. Jon Bausor’s wonderfully detailed period costumes with Alexander Balanescu’s baroque, eerie score, too, all add to a voluptuous sense of being caught back in time in a viciously woven web of intrigue and danger. Some of the sight lines are a little obscured if you happen to be sitting at the side – as I was – with too many backs to conjure with. 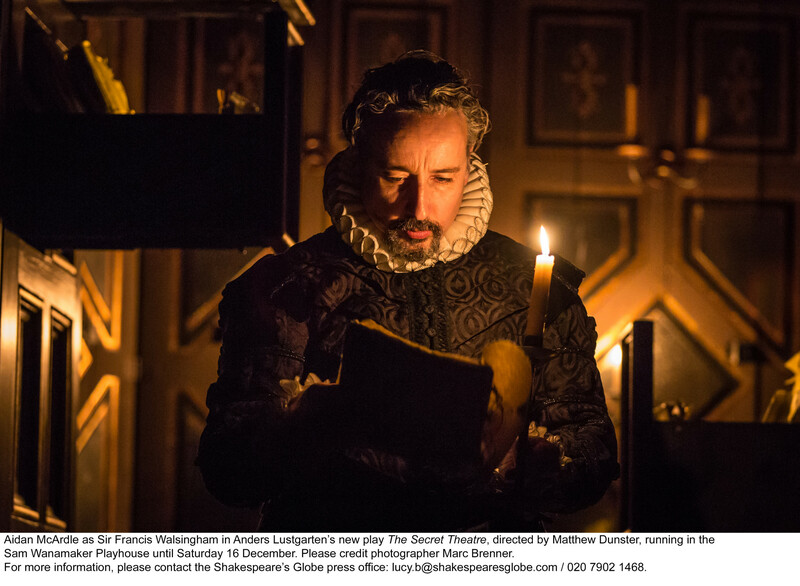 But though Lustgarten doesn’t quite achieve Howard Brenton’s level of political wit as in his drama of a similar period, Anne Boleyn, The Secret Theatre still carries enough weight and leavening humour to give us plenty of food for thought. Lustgarten has steadily built a reputation as one of our foremost playwrights and critics of authority and our political systems. The Secret Theatre shows him branching out into even wider pastures with equal success. Can’t wait for more to come!